I can't believe it's been 2 weeks since my last post. I guess times fly when the sun is shining.... And it IS shining. I have now officially retired my winter coat, scarf and gloves and enjoy long walks in the sun. This weekend is a long weekend here in Denmark - Friday/Saturday/Sunday Free! - so I want to make this a double feature: Two freebies for you today! The first one is a Grab Bag and I better explain something about it. On my computer I have a folder called "Sand Box". That is where I go playing around when I want to try out new products or techniques. I keep almost everything I make there so once in a while I need to clear out my Sand Box. The result of such a clean-out is your freebie 1 for today. 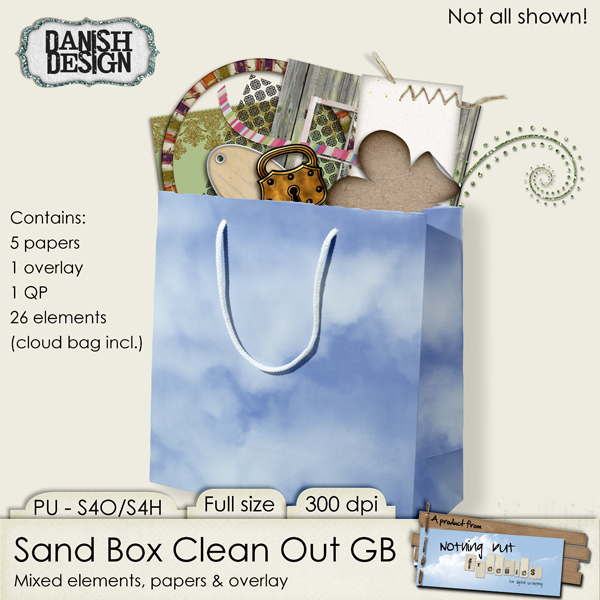 All kinds of misc-mix that never made it into a product - you get papers, elements, an overlay and a QP. I hope you will find some kind of use for it. Warning: It's a big file (app. 75 MB). The second freebie is actually an oldie. It's a template that made it from the Sand Box into my "Use" folder. It is the most basic template I can imagine but I use it often and thought you might find pleasure in it as well. So here it is - The Very Basic Template. It comes in PSD for you to fumble around with - I have left every layer open so you can add colours/patterns and move the slits around for larger or smaller pictures or replace it on the background. I have also included a PNG version for those without PS/PSE. Finally, I have included a layout of my own for example/inspiration. 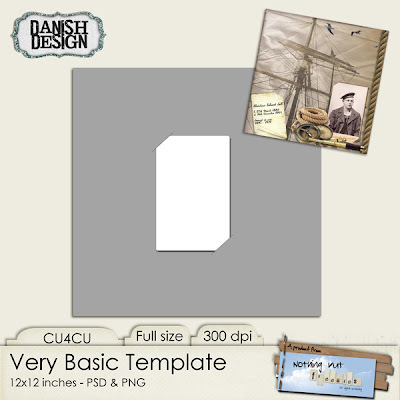 I have labelled this template CU4CU but actually you can use it however you like. I hope you'll all enjoy your weekend. I'll try not to let 2 weeks pass by before posting again. thank you so much both are wonderful! thank you so much! Hope you stay warm! myscrapbook says: Thanks for the lovely freebies they are very much appreciated. Love the tucked in photo corner template! Thank you. Glad you are finally getting some sun. As always - Thank you!